Create the Outdoor Space You’ve Always Wanted. With over 25 years of experience, we'll custom build any deck, gazebo or pergola of your dreams! Exceptional Workmanship. Premium Products. Artistic Vision. As one of the premier deck building specialists in Michigan, Cedar Works has been leading the industry in craftsmanship and creativity since 1990. 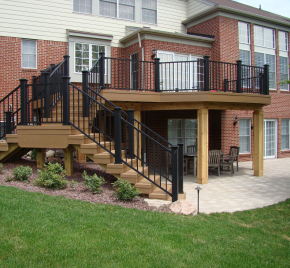 We are based in Oakland county, servicing and building decks in all areas of Michigan. Our team is committed to providing our customers with quality decks, designs, and workmanship. 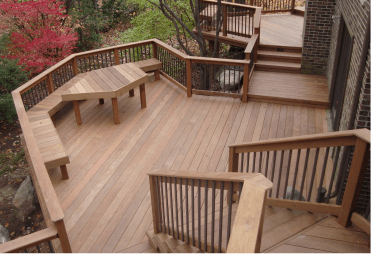 We specialize in designing and building decks from wood, PVC, and composite decks. Our outdoor living space services include the designs and builds of trellises, gazebos, custom fences, pergolas, deck railing, deck replacement, hot tub and pool decks, wheelchair access ramps, screened rooms, as well as sunrooms. At Cedar Works, we believe in complete transparency when it comes to communication with each of our clients. Throughout the entire process, we are here to provide you with the highest levels of quality workmanship, reliability, attention to detail, and professionalism. After meeting with you for the first time for your free estimate, we design a custom deck that fits your needs and wants. After you approve the design, we get to work installing it and incorporating it into your yard. We work with all types of decking materials, including pressure-treated wood, Western red cedar, Trex®, composite, and Ipe. Our crew has over 25 years of experience working with deck materials and deck railings, including aluminum railings, glass railings, PVC, and wood railings. Cedar Works enjoys leading the industry, rather than following. We also value our fine reputation. Many families who have chosen Cedar Works as a contractor have referred our company to their friends and families. That speaks volumes about our company and our level of expertise. Cedar Works is a fully-licensed and insured Michigan deck builder and a certified TrexPro® Platinum Installer. We service all areas of Michigan, including Oakland county, Wayne county, Livingston county, Macomb county, and Washtenaw county. To get started on your own outdoor living project, contact Cedar Works today to request your free estimate!